In political terms there are two solid blue nations, perched on opposite coasts, that have formed a large and powerful bloc. Opposing them are two almost equally red countries, which include the historic Confederacy as well as the vast open reaches between the Texas panhandle and the Canadian border. Between these two largely immovable blocs stands the fifth nation – essentially the Great Lakes industrial heartland. 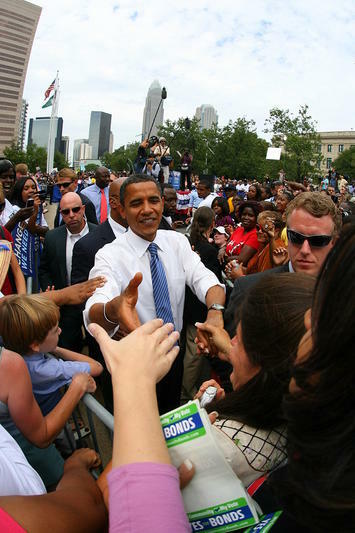 By winning this territory – which could be called “Bailout Nation” – President Barack Obama built a winning coalition. Though this part of the country has suffered economic decline and demographic stagnation for decades, it is now emerging, as former President George W. Bush would put it, as “the decider” of America’s political fate. It’s no surprise that the coastal nations voted totally blue, reelecting the president, usually by margins of 10 points or more. The first of these nations can be dubbed “the Old Country,” the most European part of America. It stretches along the coast, from Maine to Maryland, and is essentially the Democratic Party’s base. It’s where the intellectual heirs to the traditions of Progressivism, the New Deal and New Frontier are most entrenched. Republican presidential nominee Mitt Romney lost by five percentage points or more in every state from this nation. In New York and Massachusetts, Obama won with 60 percent; in Washington, D.C., he received an astronomical 91 percent. Talk about home court advantage. This area is heavily urbanized and its economy - except for parts of western Pennsylvania – has become largely de-industrialized. Good jobs here are in the professions and financial services. Unemployment is high in some states, particularly New York and Rhode Island, but low – below 7 percent – in Maryland and Massachusetts. In the Old Country, natural resource extraction industries represent a small part of the economy and populations are concentrated in large metropolitan areas, with strong minority communities. It’s ideal territory for today’s Democratic Party, which is devotedly multicultural, strongly supportive of green energy and hostile to fossil fuels, large-scale agriculture and suburban sprawl. The region is essentially solid blue – as even the appealing Senator Scott Brown (R-Mass.) found out Tuesday. In the Old Country, things remain more of the same. The election numbers were nearly identical to 2008. States like Rhode Island, for example, didn’t even shift a point, despite lower national polling for Obama and the Dems. The Old Country’s coalition partner is Ecotopia, named after the science-fiction best-seller by Ernest Callenbach. “Ecotopia” tells the story of a successful breakaway “green” republic, which embraced most of the totems of West Coast progressivism, everything from renewable energy to militant feminism. This nation includes the states of California, Washington and Oregon. To these you can add Obama’s green-oriented, multicultural home state of Hawaii. In political terms, coastal Ecotopians share their states with less progressive regions on the other side of the mountains. Eastern Washington, Oregon and California all tend to be conservative – but are usually outnumbered, as they were this year, by the more densely populated coastal areas. Together, these two nations represent 186 electoral votes, almost equal to Romney’s total. They overwhelmingly send Democrats to Congress. And they have outsized influence. Ecotopia is home to Silicon Valley, while the Old Country, along with Hollywood, has turned the culture industry into an adjunct of the Democratic Party. For their part, the Republicans increasingly control two nations. One is the former Confederacy, which supported the former Massachusetts governor – only Virginia and possibly Florida slipped over to the Obama. This region has some of the nation’s strongest population growth and a strong allegiance to the military, one key GOP voting bloc. Energy defines much of the southern rim of the Confederacy. Texas and Louisiana have seen strong growth from oil and gas. Even the remaining Democrats in this region fear federal energy regulation under Obama will slow their economic growth. President Bill Clinton won Louisiana in 1996; this year the state went for Romney by an astounding 20 points. 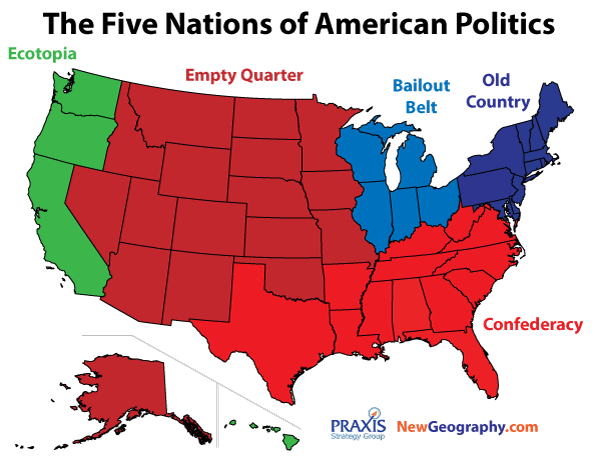 The other nation in the GOP camp is the Empty Quarter, the vast region stretching from the Great Plains and the Inter-mountain West to Alaska. This is where much of America’s food is grown and minerals extracted. Like the Gulf Coast, many in these states feel they have much to lose from a Democratic victory. Despite losing Nevada and Colorado and possibly Florida to Obama on Tuesday, these regions have seen expanding shares of Republican vote. Across these two nations, Romney’s margin was considerably better than Senator John McCain’s in 2008. In some states, his margins expanded by 10 points or more. From 2008 to 2012, Obama lost by 10 percentage points in Utah; 7 points in North Dakota and 5 points in Montana, South Dakota, Wyoming and Idaho. Yet these Republican nations may not be as stable as their Democratic counterparts. Conservative politics is almost extinct in places like California and New York. But Great Plains voters, however unhappy with Obama, still send some Democrats to the Senate, particularly when the GOP nominates extreme-right candidates. Ultimately, the decision comes down to the Great Lakes industrial region – which we can call the Bailout Belt. For these areas, which have high concentrations of manufacturing, the auto bailout was a godsend. And the region is now even more prosperous by the discovery of vast amounts of oil and gas. The benefits of the bailouts in this election – communities revived, families uplifted – outweighed those from fossil fuel producers, which now operate under threat of a possible Environmental Protection Agency-ordered shutdown. These states, outside of Indiana, stayed with Obama – by a handsome seven-point margin in Michigan. In virtually all these states, however, Romney did better than McCain. The president was quiet about fracking during the election. Now eyes turn to the EPA, since the House of Representatives would likely oppose a ban of any kind. The Bailout Belt may have to decide its energy future before it sides with either party. And where this region decides to go, so goes the nation – the entire nation. This piece originally appeared at Reuters. odd-year elections for state and local offices, that is where the GOP does pretty well (better than one would think, given the successes of Obama in 2008 and 2012, and the fact that both U.S. senators representing the Commonwealth are Democratic former governors). Submitted by Geography student on Fri, 11/09/2012 - 16:17. Or use Google search terms "state percent federal taxes returned" for more articles on this phenomena. So many of the red states are actually receiving far more subsidy then the blue, yet want smaller government and lower taxes, less subsidy. This puts the Republicans in a real bind. It they don't keep returning the subsidy to the red states they risk loosing them, yet Republicans have to run on a platform of lower taxes. It is hardly surprising that even economists who supported Romney had to admit that his economic and tax policies mad so little sense that the had to assume he was lying (see http://www.economist.com/blogs/freeexchange/2012/10/polling-experts-3, google search terms"economist assume romney is lying". Not a formula for long term success. Submitted by lukelea on Thu, 11/08/2012 - 21:32. Don't you suppose Texas will eventually go the way of California as immigration continues? Submitted by Jay on Fri, 11/09/2012 - 10:45. So long as Republicans keep getting 40% of the Latino vote in Texas, as Romney did on Tuesday, Texas will stay red for a long, long time.